Replace the foam, not the brush! The secret behind the success of the Recessed Wheel Lug Nut Brush is the unique shape of the foam inserts. When placed on the brush, the foam surrounds the lug nut, cleaning both the lug nut itself and the opening on the wheel. The soft foam holds plenty of soapy water or wheel cleaner to make the job even easier. You can wash the Foam Inserts with McKee's 37 Polishing Pad Rejuvenator between uses. But when the inserts become worn out, do your wheels a favor and replace them with a fresh pack of Recessed Wheel Lug Nut Brush Replacement Foam Inserts. The brush will work just like new and your wheels will look spotless! 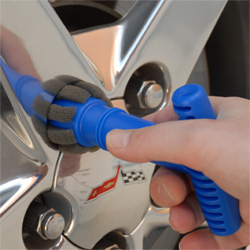 The Wheel Lug Nut Cleaning Brush fits perfectly into the lug nut cavities of Corvettes.